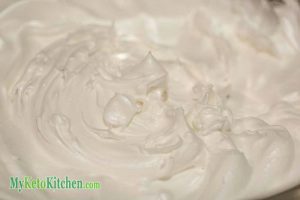 Keto Pavlova Sugar Free Meringue Dessert - Deliciously Sweet and Tasty! Our Keto Pavlova is very light and delicate when compared to the traditional carb loaded pavlova. We recommend making your Keto Pavlova on the day that you wish to eat it, as it will soften if left overnight. Don't worry though, 20 minutes at 100C/210F will firm it up if it does soften. Place egg whites into a stand mixer and whisk on high until they are foamy. Turn the mixer off and add the cream of tartar. Turn the mixer on low to medium speed and begin adding the Natvia Icing Mix, 1 tablespoon at a time. When all the Natvia Icing Mix is mixed in, turn the mixer to high and whisk until the egg whites have stiff peaks. 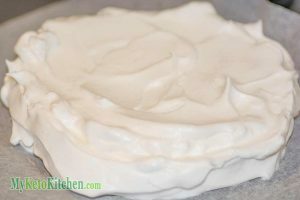 Gently spoon the meringue onto a lined cookie sheet and smooth into an 8-10in diameter circle. Leaving ridges will give a great crunchy outside. Bake in the oven for 1 1/2 hours. Then turn the oven off and leave the pavlova to dry out for another hour. Remove the pavlova from the oven and cool for an hour. Whisk the heavy cream, vanilla and natvia in a stand mixer until at the firm peak stage. 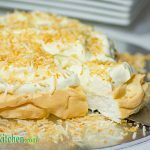 Spread the cream over the cooled pavlova and sprinkle over the toasted coconut.